[New for 2018] So I got lucky with finding all the Magnum pints early, but have you been wondering about there being any new bars for 2018? Well, there is! There's just a great balance here and I enjoyed every bite. 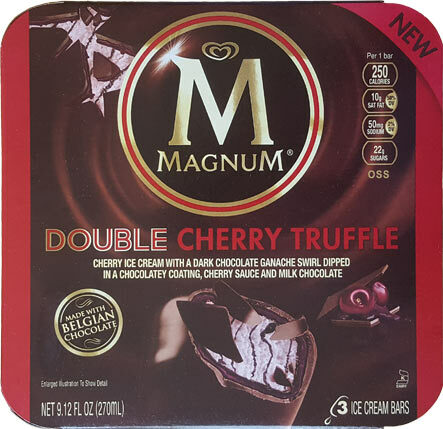 The familiar Magnum chocolate does what it does best while the cherry compliments. It's not an artificial cherry, just a nice, pleasant, non-biting cherry. I really enjoyed this. Granted I set my expectations low, but it was nice to see Magnum do what they do best without messing with foolish cocoa nib shards or anything else. Well done Magnum. Welcome back. On Second Scoop: The cherry seemed a little stronger on my second sampling, but that's about all I have to add. 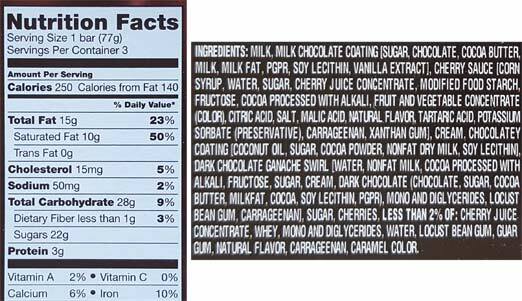 It's still a well balanced bar and I look forward to comparing them to the new cherry garcia pint slice. 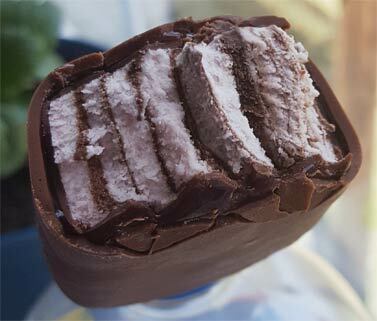 I have never, not even once, been disappointed by a magnum bar! And I don’t even particularly love bars. But to me they are the best in the biz. And as someone who also is not a fan of cherry cordials, I cant wait to try this one. I bought a box of these and they had the double shell with cherry filling, but the ice cream was just straight plain vanilla. Perfectly white with no cherry flavor and no bands of whatever flavored mix-in I see in your picture. It's like a misprint of a rare book. I still have one left from the box (the first two were both vanilla) the last one has got to worth, what, thousands? I took a picture. I can send it to the blog if you're interested. I've been waiting for you to post this review because I was half convinced it was meant to be vanilla. Have you seen Turkey Hill's "Decadant Delights" bars? They are similar to these with the cherry involvement, only the base ice cream is white chocolate and it also involves nougat somehow. Points for creativity I guess. We could use more nougat in ice cream I think.